Do you have a forgetful roommate, friend, brain, or maybe even all three? Maybe all you need is a little reminder system that catches you attention, like say, brightly colored notes that are self-adhesive? 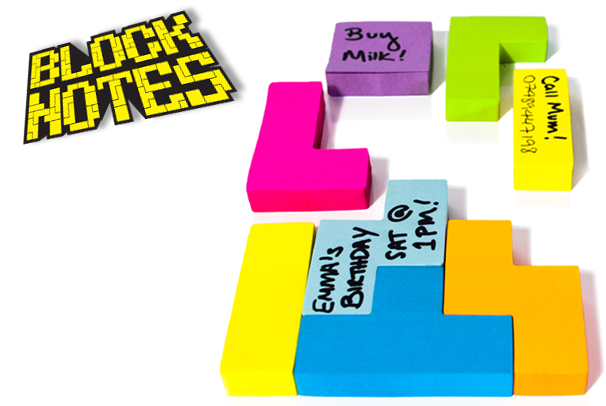 Look no further: These Tetris-themed sticky notes, called Block Notes, are shaped like the blocks from the ever-popular game, and they're an easy and creative way to spice up your physical notification center. These reminders are just pleading to be played with, and what geek could resist stacking their notes just like in the game? Just make sure you don’t complete a level before the chores or other reminders are complete, lest they be lost forever to the Tetris gods. Thankfully though, getting to choose your next block eliminates the frustration of getting a squiggly block when all you need in the world is a straight block, a feeling anybody who has played Tetris has no doubt experienced. Block Notes are available for £7.50 (about $12 US at current conversion rates).